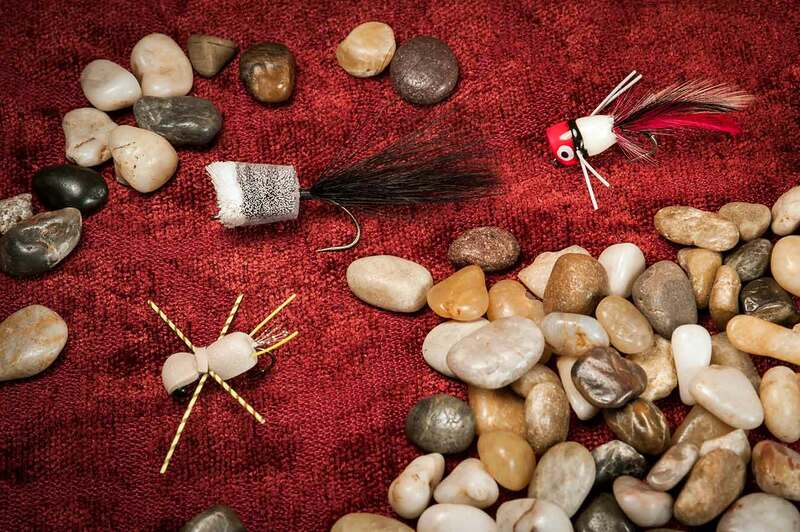 Question: What is the best way to work a popper in rivers? Most of my experience fishing for smallmouth bass is in lakes. How is it different? Good one, Byron! The answer to your question will put a lot more smallies onto MIDCURRENT readers’ poppers and hair bugs. Regarding how to work a bass popper, there’s a load of confusion out there; I believe much of it comes from how differently a floating fly is worked for smallmouth bass than for largemouth bass. For largemouths, the retrieve is slow: starting with a slap-down or gurgle of the fly or both, then a long quiet pause, and so on. It’s not always that way—I’ve encountered lakes full of largemouth bass agreeing to take floating flies only if they’re tugged and tugged to lurch ahead, constantly in motion. But normally, in my long experience with largemouths, a popper or floating hair bug worked patiently catches best. Give the fly a tug immediately after it lands (or if it lands hard, just leave it at that). Three or four seconds later, another tug. And so on. If you wait only a second between tugs, or wait not at all and keep the bug lurching ahead without pause, a smallmouth will probably look it over and then swim off without ever touching it. If you let the bug lie still for ten seconds or longer, same result. Of course, it’s also possible that if you go out and fish a popper too quickly or too slowly according to my recommendations, your smallies will pile all over it, just to make me look incompetent. 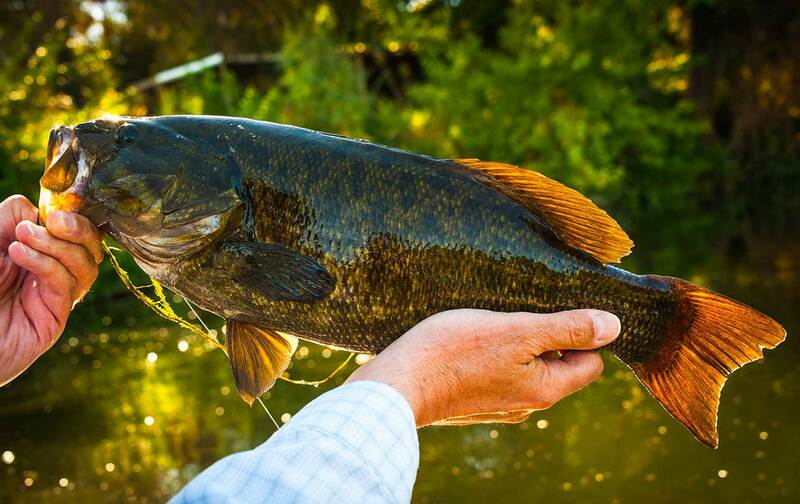 Smallmouths—all fish—are an ornery lot. But I’ve looked incompetent before. No biggie. Remember that a tug of the fly should create a soft gurgle or chug—it should not come off as a detonation. You’re trying to tempt a bass, arouse its curiosity. Traumatizing it won’t accomplish either. Now my confession: I’m far more experienced in stream smallmouth fishing than with the lake variety. I am diligently trying to log more smallie-lake time—and I have fished smallmouth lakes in several states, so I’m no newbie at this business. Anyway, what I have found regarding retrieves for hair bugs and poppers is that, river or lake regardless, a smallmouth is still a smallmouth. That is, I use the very same floating-fly retrieve for smallmouths in both flowing and standing waters. And in both, it keeps working. I suppose the main difference between fishing a popper in lakes as opposed to streams lies in where I drop the fly. In a stream, currents force smallies to make practical decisions about where they hold, so they find places where food is, where predators have trouble getting at them, and where flows are comfortable—under and alongside boulders and logs, in and around beds of water-plants, at the tail-outs of pools, and alongside that triangle of choppy current feeding into the heads of pools, etc., etc. And streams, in comparison with lakes, aren’t very deep. That said, smallies are bold. They’ll go into places—such as flat, wide-open, clear-water shallows and side channels—that would scare a trout out of his wits. So don’t count on river smallies to always cower in the safer parts of streams. In lakes, there is no current. And lakes on average go much deeper than streams. So lake smallmouths spend a lot of time down where they likely won’t even notice a floating fly. Still, lake smallies like the shallows. They may slide up over a rocky shoal to hunt, chase around beds of aquatic weeds, linger around a rock shelf four feet down. So when I fish a popper or hair bug for lake smallmouths, I usually fish the edges; I look for rock, boulders, weed-beds, and such. All shallow stuff. And then I put my bug up next to cover or just out onto water that’s two, three, or four feet deep. That’s when I tug, then count: “One-one thousand, two-one thousand, three-one thousand, four….